This giveaway is now CLOSED. The winner is Mocha Butterfly! Congratulations! Remember: There are great giveaways active on the upper right hand side of the page! This was gift number 7 in our Mother's Day Buying Guide! I had no idea that Kohls has such high-quality, stylish jewelry at such great prices! I can actually afford it! I’m definitely keeping Kohl’s in mind for my next jewelry purchase. It’s a great place to shop for gifts too! Especially Mother's Day Gifts! Our mother's day buying guide at Ascending Butterfly will encompass the entire month of May! So while some giveaways will close after Mother's Day itself, the month will still be dedicated to saying Thank You to our moms. For all the daily ways they show us they love us that may times go unheralded. I think you should show your mom you love her everyday, but mother's day should be extra special! And with today's edition to our buying guide it certainly will be! Do you pigeon hole your retail locations? Looking to one for housewares, others for clothing, others for beauty care? I know I do sometimes, but not anymore! It’s amazing what you can find at Kohls jewelry department – certified diamond earrings and rings, gemstones, pearls and name brand watches like Citizen and Bulova. All at incredible prices. And with Kohl’s discounts and savings passes, you can’t find a better value on jewelry anywhere. Kohl’s jewelry department is the place to shop for quality mother’s day gifts she’ll love, or jewelry gifts for any occasion. I am no longer going to pigeon hole my favorite department stores. I am going to become a much better 'treasure hunter' from now on! They don't call 7 a lucky number for no reason! We are very happy to launch lucky number seven in our Mother's Day Buying Guide with something that will make mom's eyes light up with delight! As you all know I was born in April making Diamond my birthstone, lucky me! So I wanted to be sure my favorite gemstone was represented in our Mother's Day Buying Guide this year! And thankfully so did our friends at Kohl's! I personally feel you can never go wrong with Diamonds, and neither does Kohls, and with savings passes and low everyday prices, there is a gorgeous gem just waiting to be discovered for everyone with every budget. Ƹ̵̡Ӝ̵̨̄Ʒ - Diamond weights are approximate. Diamond Total Weights may vary between .01 and .08 ct. Some diamonds consist of fewer than 17 facets. 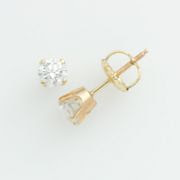 Ƹ̵̡Ӝ̵̨̄Ʒ - The earrings have a four-prong setting with 14k gold screwback posts. The certification includes an International Gemological Institute Certificate of Authenticity that verifies clarity, color and carat weight. And they come in a cute white leatherette gift box. If you can't wait to find out if you won and want to nab a pair NOW, (and who can blame you!) you can do so HERE! Don't you just ♥ Kohls? I know I do! Ƹ̵̡Ӝ̵̨̄Ʒ - How to Win: (1) You must be a PUBLIC follower of Ascending Butterfly to be eligible for this and all giveaways. Indicate in your entry that you follow (if your 'comment name/user id' differs from your profile id, please let me know what name you follow under) and (2) Visit Kohls - and post the URL of another product you like aside from the giveaway item of course, as your comment entry! Please post the LINK, not the name! (3) You must also leave your email address somewhere in your comment. (You can format it this way for security, example: ascendingbutterfly AT mail host DOT com, If it is visible in your profile, just say so, that's OK!). Please follow the easy 1, 2, 3 steps to winning! This giveaway is open to USA residents who are 18 years of age or older. FTC Disclosure Info for this Giveaway: This is not a paid insertion. This is a non-compensated post and all opinions regarding the products are expressly my own experiences. I was provided product to giveaway only not review and the sponsor is fulfilling directly to prize winner, this in no way influenced my opinion of Kohls. Once a winner is selected and their information has been forwarded to the sponsor, the responsibility of prize fulfillment rests with the sponsor. Love the 10 k gold two toned heart locket mom necklace the best. Follow @ Tracy Inglesias on Twitter. I voted for your 'springtime nyc' outfit in the Macy's fashion director challenge! I voted for you mom on ICE.com's Beautiful Moms contest - good luck! Facebook fan/liker of Kohl's, and posted message. Entered the Layla Grace giveaway, either one would be a sweet win! I follow Follow Kohls on facebook -Kathy Luman- and I wrote on the wall that you sent me. I voted for you at the Bloggers Choice ’10 Awards in the ‘Best Blog About Stuff’ Category. This is a gorgeous ring. I don't know if my comment went through, something happened. I'd love to win these earrings for my mom. I'm a fb fan of Kohls and posted on their wall. I really like this: http://www.kohls.com/kohlsStore/womens/dresses/viewalldresses/PRD~583018/Dana+Buchman+Solid+Kabuki+Dress.jsp. I follow. Thanks for the chance. I voted on fuel your blog and left a comment. I voted - 32 now! - good luck! I voted for your Mom - good luck to her!